A feature is something a product HAS. A function is something a product DOES. A BENEFIT is the itch the product scratches – the real AAAAH that the consumer experiences when they use the product. The video above is an excellent example of the above hierarchy in action. The signboard initially said “I’m blind” – a product feature. After the woman was done with it, the feature mentioned was actually a negative one – “I can’t see the beautiful day we are having”. But the implied benefit to passersby was completely different. They were made to realize how lucky they were, to be able to see in a world where this man was unable to see what a beautiful day it was. And they were able to obtain instant gratification by helping someone less fortunate. I have watched this video many times, each time it brings a lump to my throat. That is the power of great communication. It is supposed to elicit some kind of gut reaction from it’s viewer – and Purple Feather does an outstanding job here. Well done guys. We do indeed live and die by the words we choose. Choose well, my fellow marketers! Pepsi & Coke trying to sneak through another price increase in the UAE? The UAE is currently home to a storm over a recent unauthorized price increase by Pepsi & Coke… The background is that the brands increased their prices – officially & with permission – by 50% about a year ago, raising the retail prices from AED 1 to 1.5. This saw some initial consumer unrest, but things quickly settled down and this became the new normal. There is some confusion around what this means to the companies, since they have currently had no fines or penalties imposed on them, but the products are being withdrawn from the shelves. They have been given a month to complete this withdrawal, which suggests that back door negotiations might be taking place and there will in fact be no withdrawal. Any one care to shed some light on this please? A link to an article on Arabian Business is below – the comments are enlightening. 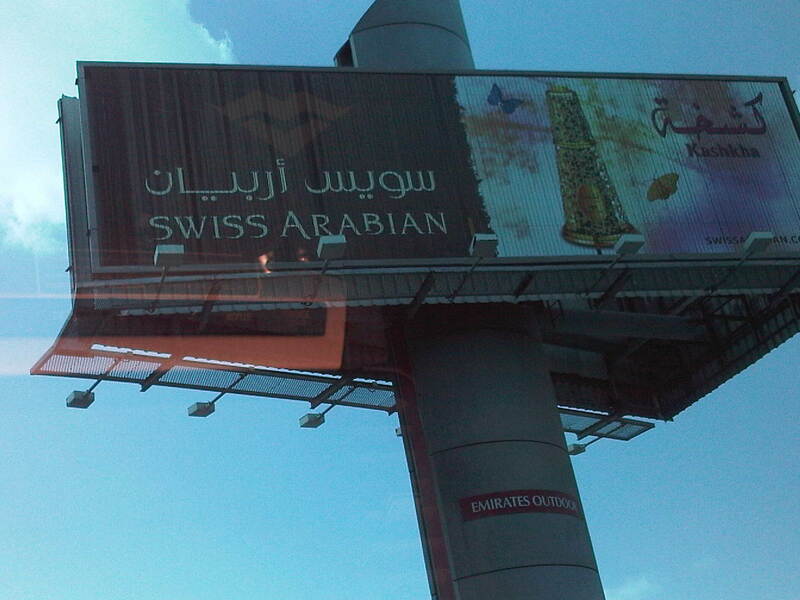 There are a bunch of frankly meaningless ads on Sh Zayed Rd in Dubai right now. I can’t waste a post on each, so I thought I should do a “worst of…” list. I’d really like to hear your comments, agree or disagree, and more importantly, I would like you to send me examples that you think should make the next list. 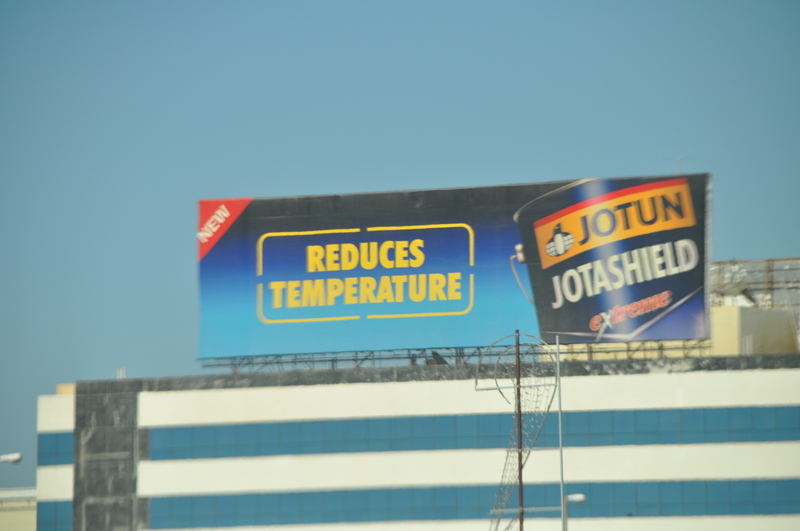 There are some that I couldn’t take pictures off, like the Gree climate control ad, or the Gulf Air billboard, so I haven’t bothered to say anything about them, but anyway. Here goes. This is fairly typical of the “announcer” category of advertizing. There is no perceivable benefit, and that’s my beef with this ad. It is in a prime location, and the only thing we are supposed to know about it is that it comes from Austria. And the tiny text tells us that we can win prizes if we go to the website. Wow. Really? That’s how you plan to beat Power Horse and Red Bull, both of which are built on solid emotional benefits… opportunity lost. 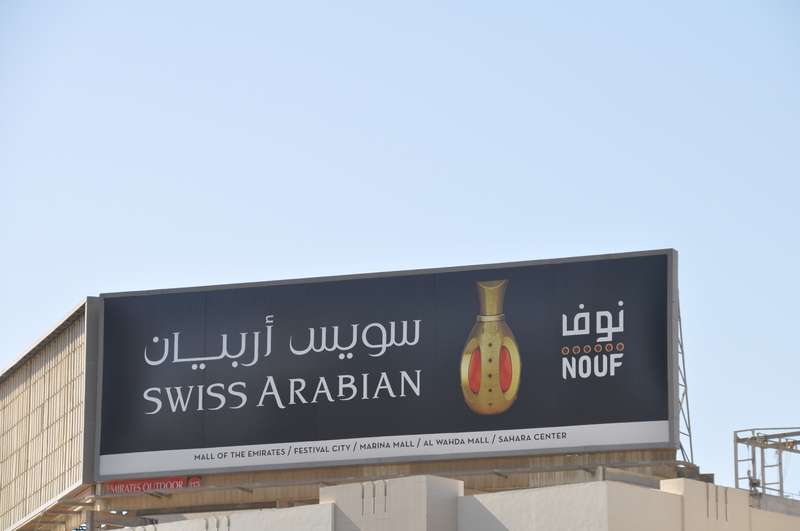 Swiss Arabian Perfumes Group is clearly concerned about their competitive situation – they are investing heavily in outdoor in the area. However, their communication falls into the very basic category – company name, and a picture of a perfume bottle with a stylized name. Guys, with so many benefits attached to the category, I’m sure you can find one. One. Ask consumers why they buy your brand – and build on that. It will really help you to maximize the ROI on your investment, and build your brand equity to boot. C’mon guys. You can do it. 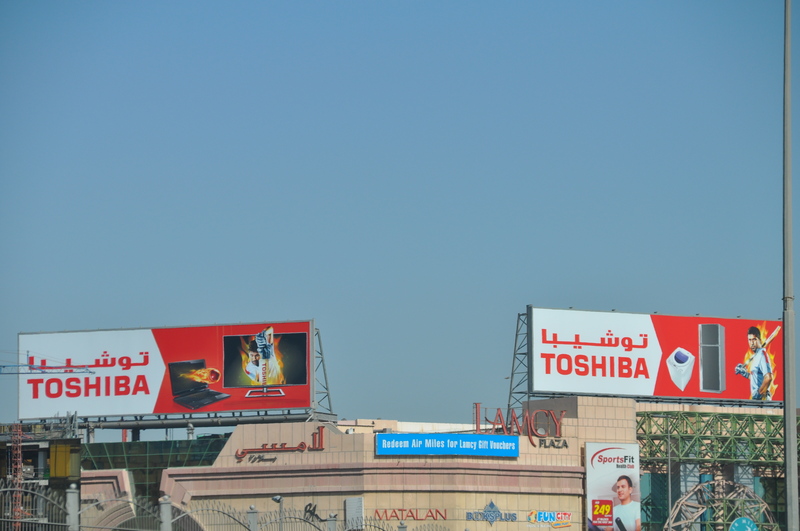 These billboards win the prize for worst advertizing on in Dubai currently… one shows an angry cricket player (Sachin I think) with a flaming bat ready to go to town on the products in front of him. The second shows products with flames erupting from them. I think they are trying to show how ‘hot’ the products are… not really sure. These ads are really quite a horrible example of the art of communication, and a complete waste of space. Toshiba, for God’s sake, please do better. Oreo gets it backwards for the Arab consumer??? The Oreo campaign in Dubai - getting it backwards for the Arab consumer? The problem lies in the translation of global brand strategy into new cultures and markets. Arabic, unlike English, is read from right to left. So, to the Arab consumer, Oreo is saying “Dunk. Lick. Twist.” Really? This reminds me of the ad guy who developed a campaign for a company launching a new beverage in the Middle East. He showed one image of a guy dying of thirst in the desert. Then the next visual showed someone offering him a drink of the new beverage. And then the third visual showed the guy refreshed and running off with a bounce in his stride. The campaign was a huge failure… and the ad guy was fired. When one of his friends called him to ask what went wrong, he explained that the campaign was aired in an Arab country, so people looked at the visuals from right to left – the guy running, someone offering him a drink, and then him dying in the desert… Ouch. LG oh LG what an opportunity lost! LG is having a bit of a tough time in the Middle East region currently. Before the launch of Samsung’s SMART campaign (“Our first name is SMART”), the difference in their shares in the UAE TV market was around 4-5%. Now, the gap has widened to 16-18%. I’ve been scratching my head to understand this issue – this challenge that LG is facing today. To have a technology edge is one thing – but I don’t believe that the problem lies in LG’s technology. No, their problem appears to lie somewhere else. What is this ad all about? The “next generation”? Really… what does this mean? Should the consumer care? And then the stuff clumped together on the right… meaningless jargon for the consumer to ignore. So, its no small wonder that market share for the brand is collapsing. The question is – is this a lapse? A one-time error in a campaign can sometimes happen. Sadly, this does not appear to be the case. What is this ad all about? 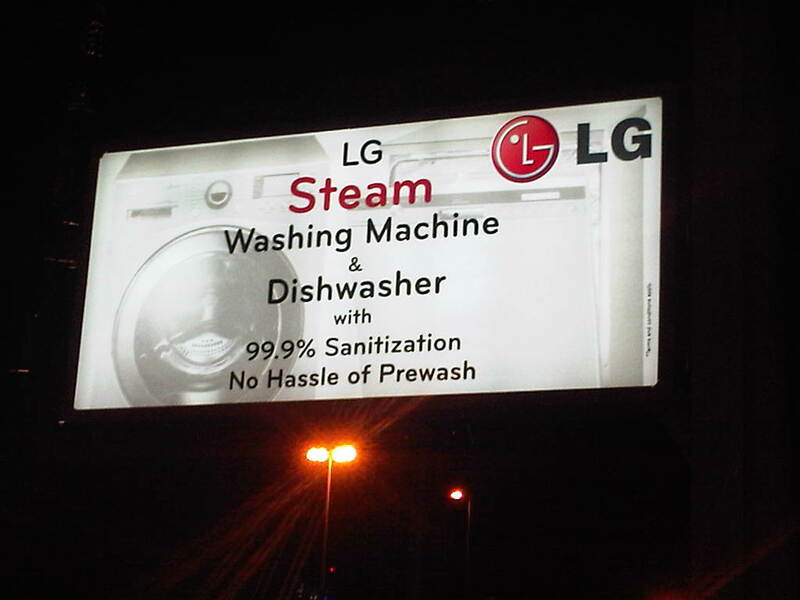 A washing machine with great sanitization qualities. Yawn. What does it MEAN to the consumer??? Where’s the BENEFIT? The itch that this product scratches better than competition? It could have been so much more… anything from an emotional “Keeps your family safe & protected” to a functional “Kills the germs that are commonly found in your laundry better than anyone else”…. The Steam is a strong technology RTB (Reason-To-Believe) that supports your claim & ultimate benefit. What an opportunity lost. 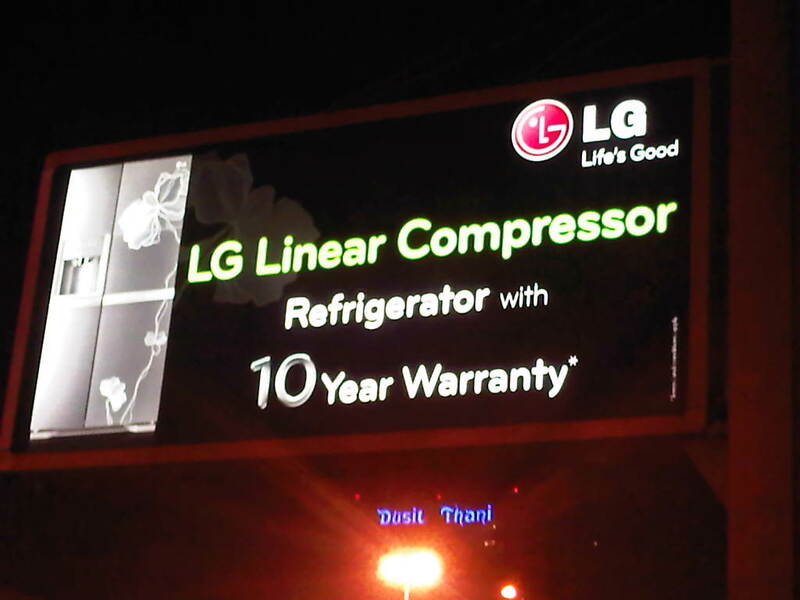 Linear compressor… really? What the heck is a linear compressor, and why should a consumer care? A 10-year warranty? Great. Why stop there? Please, make a claim that you can own, offer a true consumer benefit that consumer’s “get”. For example… “Peace of mind for 10 years’. Wow. Or “The best cooling in its class – by far!” Why? Because we have the unique Linear Compressor, which blah blah blah. The Linear Compressor can be a great RTB, but it is not a BENEFIT. Please Team LG, your products are as good as any, and I’m sure some are actually better than the competition. Your communication – the story of the brand that you need consumers to connect with – leaves much to be desired. Could this be at least part of the reason that LG is facing such challenges in the market? We braved the long lines in the sun, chatting happily about Canadiana as we waited up to 45 minutes to order. We tolerated the strange ordering system put in place, with one over-worked cash counter serving the hundreds who queued up to get their fix. We hung about waiting to pick up our orders. We searched for a place to sit after we had finally been rewarded with our ordered food and beverages. When I finally sat down and took my first sip of French Vanilla, I was delighted. It tasted exactly the same! Fantastic! And then I finally took a look at the bill – in the rush of ordering, and the mass of people, I had just paid whatever was asked and not even thought about it. Now, I took a look and was confused. As I did the math in my head, I came to a startling realization. The prices were roughly double the prices in Canada. I re-checked my math. It was correct. My French Vanilla was around $4, vs. around $2 in Canada. 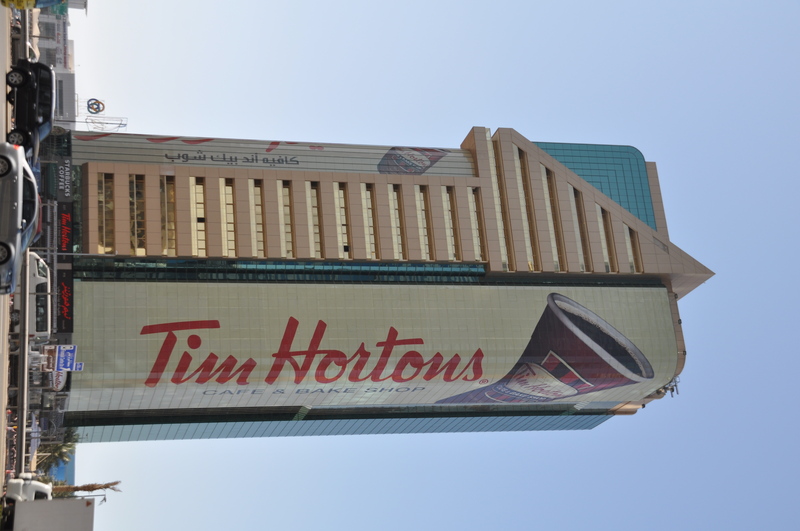 So, why would Tim’s, a Value-For-Money chain in Canada, take on a premium pricing strategy in Dubai? The prices are just a dirham ($0.30) or two shy of Starbuck’s, not that the coffee can be compared (I’m a loyal Tim’s fan, so I think their coffee tastes better!!). BTW, as an aside, the first location opened next door to a Starbuck’s and the consensus among my friends is that it has had a significant impact on their business. Coming back to pricing, I believe that pricing is a key part of the marketing mix. It says what the product is worth. So, from one perspective, this higher pricing makes sense. 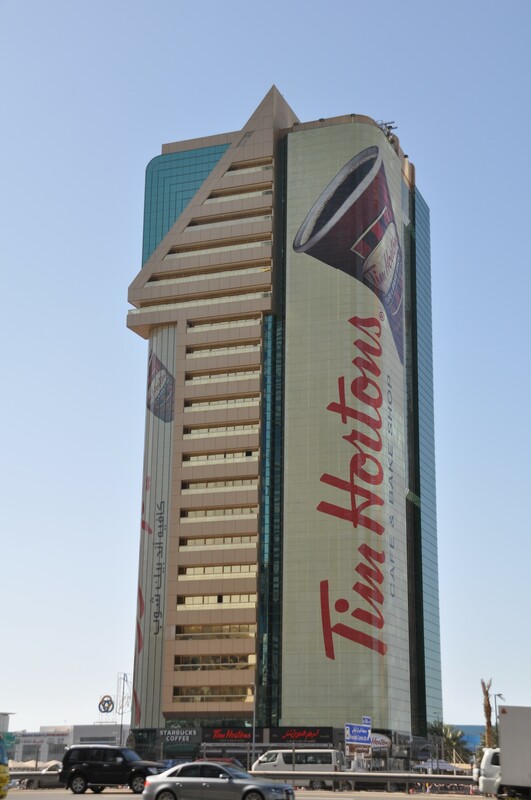 It might be part of a skimming strategy, where as the franchise grows and the runaway demand stabilizes, Tim’s will either drop their prices on key SKUs, or start regular price promotions to get closer to the VFM positioning that is such a critical piece of its success in Canada. Or, it might be a decision taken by the powers that be to position the brand at a premium in this market, because the core loyalists of Tim’s (myself included) will pay the premium charged… time will tell. 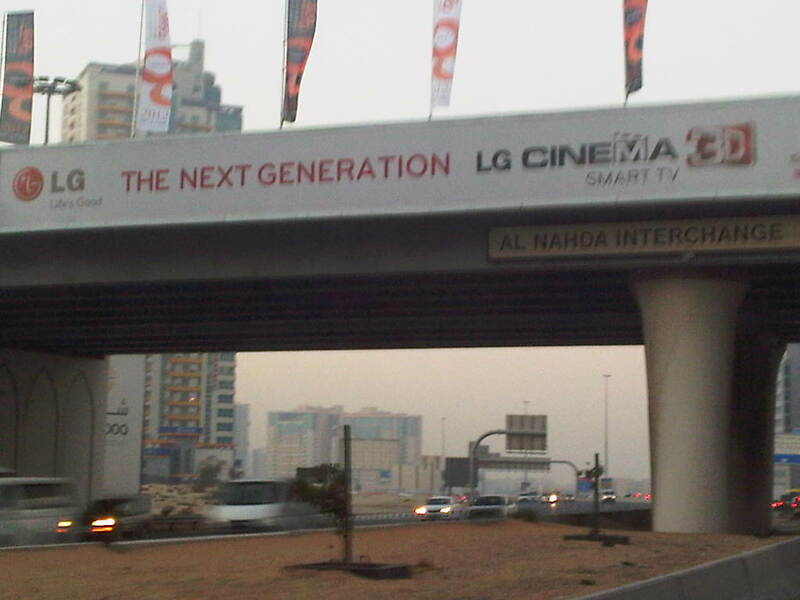 The brand has been launched with tremendous outdoor support in Dubai, and is the talk of the town. 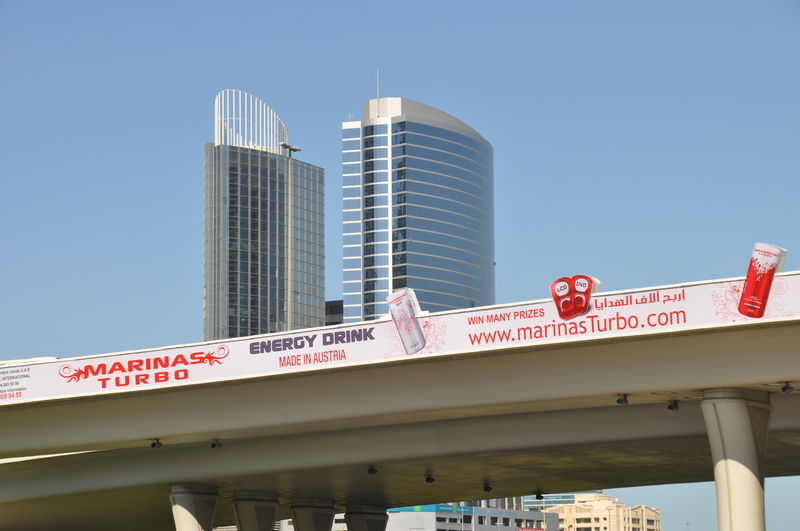 The brand currently dominates the outdoor scene, with several huge billboards in key locations, not to the mention the building wrap in the picture above. There are plans to open 125 more branches across the GCC in the next 5 years, and I for one can’t wait! Every action you take is either a Deposit into or a Withdrawal from your Bank of Brand Equity!